Distracted driving is driving while doing another activity that takes your attention away from the road (Multi-tasking). Every day in the United States, more than 9 people are killed and more than 1,153 people are injured in crashes that are reported to involve a distracted driver. When most of us think of distracted driving, we think of texting and driving and we often overlook other dangerous distractions common in our lives. We ignore talking on the phone (whether it be hands-free or not), we ignore eating and driving, we ignore distracting conversations or searching for notes in the seat next to us, and we embrace the use of GPS technology (another electronic devise taking our eyes and minds from the road). The truth is that we are surrounded by distractions, and distractions once thought of as benign have been proven to be dangerous. Remember the big “hands-free” cell phone movement a few years back? Fourteen states now have a hands-free law on the books. Hands-free cell phone laws address two types of distractions: visual and manual distractions. However, there is a third type of distraction that “hands-free laws” do not address: cognitive distraction – taking your mind off the road. Recent studies show that “hands-free” cell phone use does not actually eliminate the cognitive distraction associated with using a cell phone while driving. Contrary to longstanding common belief, the human brain cannot multitask. Multitasking involves using the same cognitive mechanisms simultaneously for different purposes. It is the mental equivalent of speaking, humming, and whistling at the same time. We can’t do it. Instead, the human brain can switch back and forth quickly between tasks, but we cannot actually perform two tasks at once. Be safe. 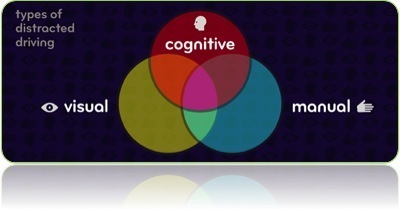 Be aware of the three forms of distracted driving: visual, manual, and cognitive. Understand that distracted driving is any type of multi-tasking on the road. We know it is tempting to pick up that phone call, or to look at the accident after having waited thirty minutes for your turn. We all do it occasionally, but that does not mean we should justify it. We should strive to eliminate these distractions. In the abstract, this is an interesting topic. On the road, it may literally prove to be a matter of life or death. If you or a loved one has been injured or died as a result of distracted driving, call us. We offer consultations free of charge. 1-(804)-733-3100.